I loved, loved, loved all the photos my BFFs sent of special people (even furry ones) in their lives who make their hearts melt! Mine melted right along with yours! I’m posting a few of them here so we can all enjoy celebrating love together. Big hugs for these heart-warming pics to Julie H, Jill J, Connie S, Carol W, Cheryl G, and Madeline G-C! And I want to announce the winner of my Won’t You Be My Palentine? giveaway: Diane Stanko. Congrats to Diane, who’ll be receiving some choc-tastic goodness for her mind and tummy! 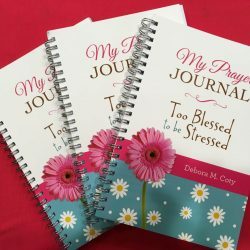 Too Blessed to be Stressed: My Prayer Journal – a lovely collection of prayer starters and scripture selections designed to augment your daily spiritual refreshment time. 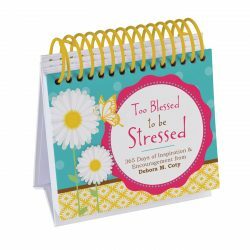 Too Blessed to be Stressed Perpetual Calendar – back by popular demand! An updated re-release of 2013’s super popular desktop flip-calendar of stress-busting quotes and daily scriptures that leaves you with a smile on your face. Details will soon follow in my next e-newsletter (so sign up at my website if you don’t automatically receive it in your inbox). Oh, and one more thing … many thanks to those of you who have asked about my knee surgery recovery – you make my heart warm and fuzzy all over! I’m actually doing pretty well. Not back on the tennis courts yet (my passion and personal sanity therapy, as you well know), but hopefully it’ll happen soon. Thanks for caring! 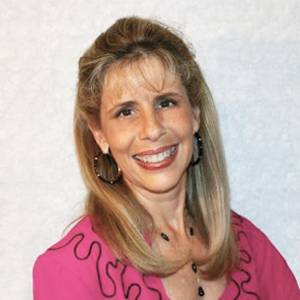 Congratulations to Diane Stanko. Enjoy! !